You find the most fascinating and worthwhile news to share; thank you yet again. 1. He's a marvelous stage director; why hasn't he done it more? HIs production of "Arms and the Man" on Broadway (starring Kevin Kline, Raul Julia, and his then wife Glenne Headly) was excellent, and his "Balm in Gilead" at Steppenwolf (with many of their later-famous ensemble members, most especially Gary Sinise and the unforgettable Laurie Metcalf) was quite simply one of the indelible theatrical experiences of my life. 2. Why isn't "The Glass Menagerie" available on DVD in the US? Paul Newman directed it beautifully, but most especially it's the best evidence on film of what a great actor Malkovich is. I've wondered about that Glass Menagerie, as well. It seems like a natural for a DVD. Karen Allen is Laura, right? I'd love to see it. I'm not sure what movie people are likely to think of for evidence of his acting prowess. Maybe Being John Malkovich because it has his name in the title? Of Mice and Men? Dangerous Liaisons? I'm not sure I knew that he'd directed "Balm in Gilead." Wow. That comes up so often on people's lists of "transcendent experiences in the theater," but mostly they mention Laurie Metcalf and her monologue. I suspect if he didn't live in France, he would come back to Steppenwolf to direct. Or maybe I'm just crazy. I had to look some dates etc. on Malkovich in wikipedia, and discovered that he has lived in Massachusetts since 2003. Hm, never heard that. There's an interesting book ("No Tricks in My Pockets") about the making of the film, the author being a longtime friend of Paul Newman who was able to talk to him and watch the process. One amusing passage has to do with Newman's different ways of communicating with each of the four actors. He and Woodward had their own terse shorthand, of course; and he knew that he had to let Malkovich try each crazy idea that came to him during rehearsal ("What if Tom were bald? "), so he could eventually discard them all and commit himself to the simple and right portrayal he ended up with. But the dilemma was Naughton, and for an unusual reason: he was instinctively doing everything right as the Gentleman Caller, and yet they had a whole rehearsal and shooting schedule to get through. Newman couldn't just ignore him and say nothing, or the actor would feel neglected and insecure; yet telling him he was doing everything right ran the risk that he would become too self-aware and start "imitating" his own performance. 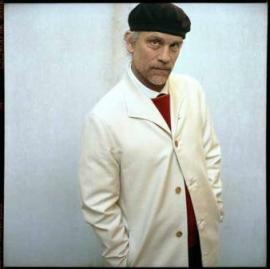 As to your final point: Looking through the Steppenwolf website, I see that Malkovich has returned to direct (also to act) on occasion, most recently in 1999. Still, he ought to be in big demand in that capacity, everywhere. "Balm in Gilead" is kind of a shapeless sprawling script, and he gave it style and focus while keeping it full of teeming life. Really exceptional work.